We have previously reported exclusively on this portion of the operation to highlight the advantages of robotic technology (13). 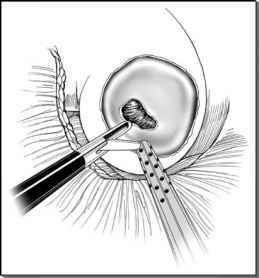 The 0° lens is used for the apical dissection and the remainder of the operation. The bipolar cautery and scissors are used for the apical dissection. The Foley catheter is introduced. An assistant provides gentle traction by pulling the prostatic stay suture superiorly. The periurethral tissue is sharply separated from the urethra and the prostatic apex is defined. The urethra is divided sharply with scissors. Any remaining prostatic attachments are freed and the prostate is placed in an Endopouch™ Retrieverf to be removed later. In our experience, and as reported by others, the most common location for a positive margin is the apex (14,15). Therefore, we routinely excise periapical soft tissue for frozen section analysis. If indicated, biopsies from other areas may be obtained at this time. If a biopsy contains carcinoma, then additional tissue is resected until a negative margin is obtained. Analysis of our results has shown that this procedure did not alter the already low (2-4%) positive apical margin rate in patients with organ confined prostate cancer, but did lower the positive margin rate in patients with pT3 disease from 30% to 11%. This may seem like "cheating" to the open surgeon or the traditional laparo-scopist, but robotic surgeons realize that three-dimensional visualization and wristed instruments do allow them to remove a generous soft tissue margin around the urethra without sacrificing sphincteric length or compromising continence.